Question: How do Catalysts Work? · Manufacturing other chemicals such as rocket propellant! Hydrogen Peroxide can be purchased in varying strengths from 3% to 98%, the higher the percentage the faster the oxidation occurs so the more heat that is generated and the more hazardous it becomes. 3% is the strength of Hydrogen Peroxide that most parents keep at home to clean and disinfect cuts – this can be purchased at the grocery/pharmacy. We used 6% ( also known as 20 Volume ) this was purchased at the Beauty Supply store as they use it in hair products. (cosmetic purposes). 20-volume means that, when 1 volume of hydrogen peroxide is decomposed, it produces 20 volumes of oxygen. Yeast, a microscopic, one-celled organism belonging to the group of organisms called fungi. Yeasts are found in the soil, in water, on the surface of plants, and on the skin of humans and other animals. Like other fungi, yeasts obtain food from the organic matter around them; they secrete enzymes that break down the organic matter into nutrients they can absorb. Catalysts work by providing a place where reactants can come together to react. Why use Yeast as a Catalyst? Cells in yeast and other organisms contain a catalyst called catalase. Through normal cell processes, living things produce hydrogen peroxide in their cells. But hydrogen peroxide is a poison so the cells need a way to break it down very quickly. Cells contain catalase, which breaks down hydrogen peroxide at a very fast rate. A single molecule of catalase can catalyze the breakdown of millions of hydrogen peroxide molecules every second. 5) Choose Food Coloring Color of Choice and add 4 drops of color in total to drip down the inside of the bottle. 8) Step back and enjoy! Did you think this was cool? We call it Tusker (Elephant) Toothpaste only because what happens in the bottle looks like enough toothpaste for an elephant to use! A small amount of Hydrogen Peroxide generates a large volume of oxygen, so when the catalyst of Yeast is added, which contains catalase, the liquid begins to break down very quickly and reacts with the oxygen and starts to quickly push out of the container. 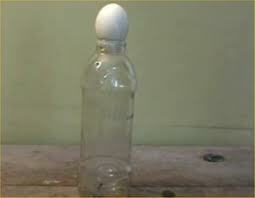 Oxygen quickly leaves the container causing strong foam so it erupts out of the top of the bottle. This foamy substance is caused by RAPID decomposition of Hydrogen Peroxide.